Countless others struggle with the “blahs” and negative moods year-round, but few equate it with one of the biggest mood influencers around: your diet. What are the 4 WORST Foods for Your Mood? Is a bowl of ice cream your go-to reward after a long stressful day? The sugar it contains could make your mood even worse, as it suppresses a growth hormone in the brain called BDNF, which is known to be low in people who are feeling sadness and despair.2 Not only that, but it will cause a rapid increase in your blood sugar (the sugar rush) … followed by an inevitable crash (the sugar crash) that will leave you feeling lethargic, tired and probably cranky. A glass or two of wine on occasion is fine, and may even boost your mood temporarily. But if you consume the entire bottle, your mood is likely to plummet soon thereafter. Alcohol is a depressant, after all, and it will have a depressing effect on your mood. These foods can be eaten with abandon, as they will only serve to boost your mood and emotional well-being. A big salad or a side of steamed spinach will give you a hearty dose of folic acid, a wonderful nutrient to improve blood flow to your brain and boost your mood by helping your body maintain levels of serotonin. If you’re not a fan of salmon, taking a high potency fish oil supplement is a good way to get your daily dose of omega-3s. These healthy sources of protein are excellent sources of vitamin B12, too. B vitamins, including vitamin B12, play a role in producing brain chemicals that support mood health, and low levels are linked to poor mood. A high quality B vitamin supplement may be particularly helpful for additional support during times of stress and fatigue. Just one Brazil nut provides about 120 mcg of the antioxidant selenium, which is about twice as much as the recommended daily allowance. Low selenium levels are linked to poor mood,5 whereas supplementing with selenium daily has been found to significantly boost mood. Because it’s possible to overdose on selenium, you need to be careful with taking too much, but you’re unlikely to overdose when you get selenium from food sources. Papaya is a tasty source of vitamin C, which is well known for its beneficial impact on mood. One study found that vitamin C boosts mood scores by 34 percent among hospitalized patients with low levels.6 One average-size papaya contains over 300% of the recommended daily value, so even a cup or two should boost your C levels — and your mood — significantly. Remember how a bagel can send you on an emotional roller coaster of mood swings due to its rapid impact on your blood sugar levels? Black beans have the opposite effect. As a complex carb, they provide your body with a slow-burning source of energy that keeps your blood sugar levels even and balanced throughout the day, which means more energy, and more mood stability, for you. Dark chocolate is actually a healthy source of antioxidants, provided you eat it in moderation. 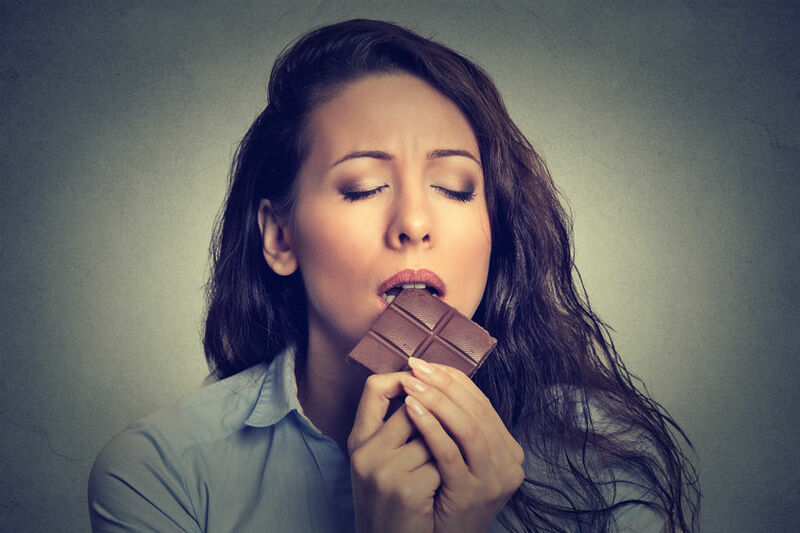 Even better, dark chocolate in particular may help lower stress hormones like cortisol and catecholamines, leaving you less anxious and stressed.7 This mood-boosting effect was found among those eating just 1.4 ounces a day … so you don’t need to overdo it (and remember, milk chocolate and white chocolate are much higher in sugar, and may therefore have the opposite effect on your mood). Sipping on a cup of green tea may have a calming effect on your mood, thanks to an amino acid it contains called theanine. Theanine is unique in that it helps promote a state of deep relaxation while also promoting mental alertness, and it even helps to counteract the stimulating effects of caffeine. Inositol: Required for proper formation of cell membranes, inositol is part of the B-Complex family of vitamins. Many people take Inositol for help with mood stabilization and to help reduce daily stress and anxiety. Ginseng: Ginseng is an herb known to help improve your body’s resistance to stress. St. John’s Wort: Used to promote emotional health and maintain normal mood, St. John’s Wort appears to be help relieve mild mood problems, and is even used as a prescription antidepressant in Germany. 4. Complement Ther Med. 2012 Jun;20(3):119-23. Epub 2012 Jan 30.